While the Romantics looked to nature’s mountains in the form of Mont Blanc, the Jungfrau, or Skiddaw to find a visible externalization of their psychology,1↤ 1 On the development of this trend, see Marjorie Hope Nicolson, Mountain Gloom and Mountain Glory: The Development of the Aesthetics of the Infinite, The Norton Library (1959, rpt. ; New York: W. W. Norton & Co., 1963). We may note here that “mountains” do, in fact, appear more frequently in Blake’s imagery (161 times in the poetry) than in Wordsworth’s or Shelley’s. This is, to be sure, hardly true of mount/mountain imagery at large; one finds at once that Blake uses no adjectival combinations such as “mountain gloom” or “glory.” But the “mountains” themselves are more numerous, and more strange. Blake’s mountains reflect an interior vision of the mountains of mythology and those, not far distant, of the Bible. These befit a poet who saw his visions in the worlds of thought and, from all accounts, never saw a genuine mountain (much less a Welsh one) in his life. Mircea Eliade summarizes the mythological dimension: ↤ 2 Mircea Eliade, Patterns in Comparative Religion, trans. Rosemary Sneed, Meridian Books (New York: World Publishing, 1963), p. 199.
begin page 197 | ↑ back to top One mountain, however, serves to site and anchor both Testaments: Mount Zion, “Beautiful for situation, the joy of the whole earth” (Ps. 48:2), “the holy Mountain” (Zech. 8:3) of the Lord and synonymous with its city, Jerusalem. So Paul reminds the Hebrews, “But ye are come unto mount Sion, and unto the city of the living God, the heavenly Jerusalem” (12:22). Tiny Mount Zion is to “tower over the other mountains” (Clifford, p. 157; cf. Is. 2:4, Mic. 4:1). As Jerusalem is to Mount Zion, so she was and will be to Albion; which is to say that Albion is—or rather, was and will be—a holy mountain. Holinshed, who begins his Chronicles discussing the legend of the ancient denomination of England, refers to speculation “whether Britaine was called Albion of the word Alb, white, or Alp an hill.”11↤ 11 Holinshed’s Chronicles of England, Scotland, and Ireland in 6 vol. (London: J. Johnson et al., 1807-1808), I, 6. The name in fact is connected with the root of Latin Alpis, Gaelic alp, and Irish ailp, meaning mountain. Blake plays on this assonance and etymological connection, imagining that Los’s “voice is heard from Albion: the Alps & Appenines / Listen” (J 85.16-17). As only high mountains tend to be white (with snow), the traditional association of Albion with albus could also be seen to suggest that Albion was once a high mountain, now islanded by the sea. This could be confirmed by Albion’s white cliffs, a word Blake generally uses in its less common sense of “a steep slope, a hill.” The cliffs are the sides of Albion’s great mountain as it slips down below the surface of the sea: “ . . . Albion the White Cliff of the Atlantic / The Mountain of Giants . . . ” (J 49.6-7). Why the Sanctuary is not attained by the waters of the Deluge is clear: Deluge is the reign of Tehom, of old a demonic power, familiar from the creation stories. The Sanctuary is the type and representation of Kosmos and of Paradise and as such a power diametrically opposed to Chaos; when the Semites maintain that the Sanctuary was not reached by the Deluge, this is not only due to the opinion that the Sanctuary is the highest place in the world, but also to the conviction that Chaos cannot gain a complete victory over Kosmos, for behind the latter is the creative power of the supreme being. Rears its immortal pinnacles. . . . These mountains rise out of the sea of time becoming the “infinite” and “eternal” mountains, the site of paradise: “the Garden of Eden . . . the golden mountains” (J 28.2), “the mountain palaces of Eden” (J 41.3-4). 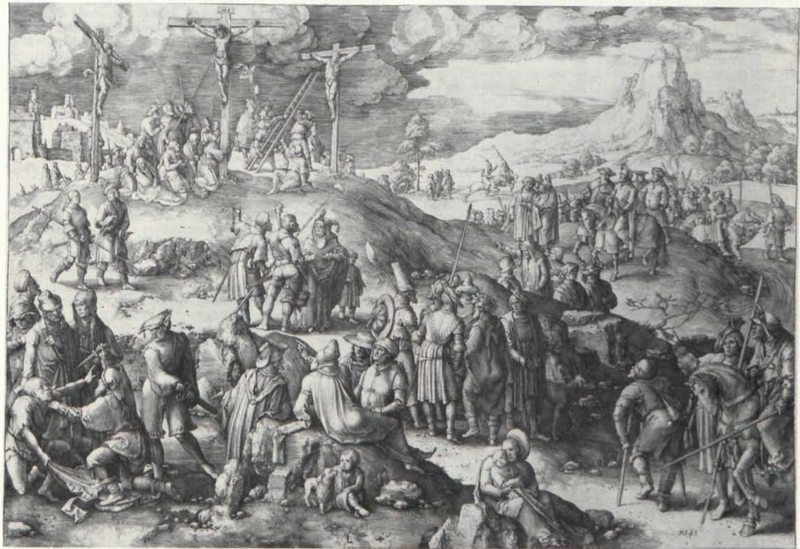 1 Lucas van Leyden, “Calvary” (1517; 11 1/8 × 16 1/4 in.) Courtesy of the British Museum. a formula which occurs three times (M 3.1-2; 19.20; J 59.16). The Tent is the Sky (M 29.4), and the plural mountains reach back to the common mythological idea of a central tent-pole, axle-tree mountain, and four smaller poles making a square around it (the sort depicted, in cross-section, dropping around plates 1 and 21 of Job). The image also evokes “mountainous Wales,” where Albion’s ancient inhabitants fled originally to escape the Saxons, there finally to be conquered by Norman Edward I, who, as retold by Gray, put to death “all the Bards that fell into his hands”—the poetic being of Albion.17↤ 17 According to Mallet, however, “the ancient inhabitants of Britain have been dispossessed by the Saxons of the greatest and most pleasant part of their island, and constrained to conceal themselves among the mountains in Wales, where, to this day, they retain their language, and preserve some traces of their ancient manners;” Northern Antiquities, trans. (London, 1770), I, 70.
begin page 199 | ↑ back to top Are mine. here will I build my Laws of Moral Virtue! Humanity shall be no more: but war & princedom & victory! In less than ten lines, “Albions mountains run with blood, the cries of war & of tumult” (J 5.6). These sacrifices in turn react on their sites as ↤ 18 The mountains shrinking “like a withering gourd” suggests God’s action on the gourd tree sheltering Jonah; He “prepared a worm . . . and it smote the gourd that it withered” (Jonah 4:7). One may think also of the comparison of the earth to an apple, withering into mountainous ridges. Other of Albion’s fallen mountains are listed in another catalogue: “ . . . the Peak, Malvern & Cheviot Reason in Cruelty / Penmaenmawr & Dhinas-bran Demonstrate in Unbelief” (J 21.34-35). The single appearance of “Dhinas-bran” may refer to “Dîn Brëon, the Hill of Legislature,” which “was the sacred mount, where . . . the ancient judges of the land, assembled, to decide causes.”19↤ 19 Davies, Myth and Rites of the British Druids (London, 1809), p. 6. Damon suggests the obscure “Dinas Bran,” a hill in north Wales topped by the ruins of an ancient camp. Unconvinced himself, he adds, “Blake might really have had in mind Dinas Penmaen, and ancient British fort which could hold twenty thousand men. 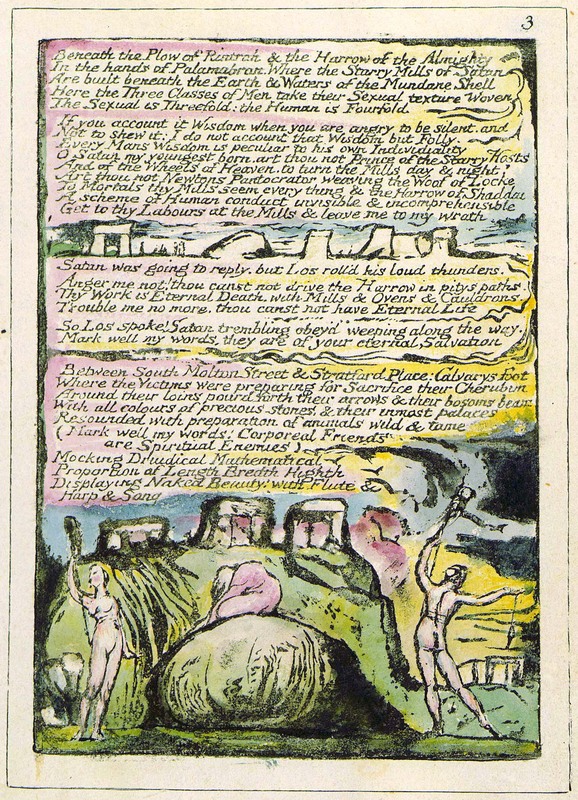 It was on the summit of Mount Penmaenmawr” (A Blake Dictionary: The Ideas and Symbols of William Blake, rpt. [New York: Dutton, 1971], p. 103; cf. J 18.38 where Hand and Hyle are “Building Castles in desolated places, and strong Fortifications”). One argument against “Dhinas-Bran” as a “camp” is that all the others are specific mountains or mountain ranges; but this remains unsatisfying at best. 2 Hograth, Industry and Idleness, pl. 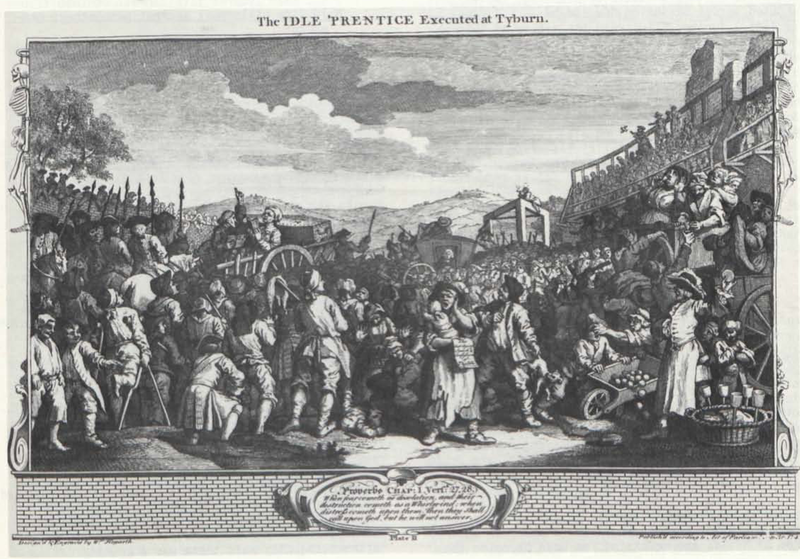 XI, “The Idle ‘Prentice Executed at Tyburn” (1747; 10 1/2 × 13 1/4 in.). Courtesy of the British Museum. Clifford notes the suggestion that “the feast on the mountain of the bodies of the enemy is a transformation of the exchatological picture of the ‘joyous feast’” as in Isaiah 25:6-8. “Possibly,” he concludes, “the banquet for the victorious on the mountain and the slaughter-sacrifice of the enemies are one and the same” (pp. 176-77). This duality seems applicable to the Wedding Feast of Los and Enitharmon, since they begin, with Urizen, “Rejoicing begin page 200 | ↑ back to top in the Victory” (12.35, E 303, cf. J 4.32 above). Blake’s intertwining vision of the Fall on the mountains of Israel and England follows from his conception of Druid practices and from hints in the Old Testament—unified in an image of “moral” sacrifice on mountains (classical mountains, ora, become moral emblems). His first use of the negative power of Old Testament mountains is the figure and setting of “har,” the Hebrew for “mountain,” in particular, “the mountain” (hā-hār) where Moses received the Law (cf. Clifford, p. 107ff. ); as Blake would have read in Bryant: “Har and Hor signify a mountain; ὄρος [oros] of the Greeks.”20↤ 20 Jacob Bryant, A New System or, An Analysis of Ancient Mythology, etc., vol. I (London, 1774), p. 94. The Greek root appears in the word “orology,” which the OED cites from 1781 as “the science of mountains.” So Tiriel first enters “the pleasant gardens of Har” (Tir 2.10)—reminiscent of “Eden the garden of God” located on “the holy mountain of God” (Ez. 28:13-14)—and on his return, “the mountains of Har” (7.19).21↤ 21 Harold Bloom remarks, “As Har means ‘mountain’ in Hebrew, the very phrase ‘vales of Har’ is an irony” [?] (E 863); Damon interprets the name and situation of Har as, “He who was a mountain now lives in a vale, cut off from mankind” (Blake Dictionary, p. 174). The French Revolution imagines “the old mountains . . . like aged men, fading away” (9) which aptly suits “aged Har” (Tir 8.6). On dazzling bursts of heav’nly fire. . . .
(II.3) A note adds: “‘The Persians,’ says Herodotus, ‘reject the use of temples, altars, and statues. The tops of the highest mountains are the places chosen for sacrifices’” (The Pleasures of Memory with other Poems, new & enlarged ed. [London, 1799], p. 118). Borlase remarks the Old Testament parallels and describes “Karnbrê-hill, which has all the evidences that can be desired of having been appropriated to the use of the British Religion;” these are “rock-basons, circles, stones erect, remains of Cromlêh’s, Karns, a grove of Oaks, a cave, and an enclosure” (pp. 116, 120). Thomas Pennant, in his Journey to Snowden (London, 1781), writes that his fellow-traveller climbed a local hill “on whose summit was a circular coronet of rude peppley stones . . . with an entrance to the east, or rising sun” (p. 63).23↤ 23 The imaginative power which increasingly associated mountain-tops and Druids is exemplified by a mid-nineteenth-century climber’s description of the top of “Glyder Fach”: “The scene before us, in fact, resembled the ruins of some vast Druidical temple—a mountain Stonehenge—which has been overthrown ages ago by some awful convulsion of nature. Indeed, so strong was our impression that we were in the midst of venerable Druidical remains, that it was some time ere we could convince ourselves that what we saw was in reality a chaotic mass of stones thrown into inconceivable convulsion” (John H. Cliffe, quoted in Edward C. Pyatt, Mountains of Britain [London: B. T. Batsford, 1966], p. 67). “Zion Hills most ancient promontory” is a formula which appears twice elsewhere in Jerusalem. Plate 12 asks after the burying-place of Etinthus and suggests in further questions, ↤ 24 See also Michael J. Tolley, “Jerusalem 12:25-29—Some Questions Answered,” Blake Newsletter, 4 (August 1970), 3-6; and David V. Erdman, Prophet Against Empire, rev. ed., Anchor Books (Garden City, N. Y.: Doubleday, 1969), pp. 474ff. Ever weeping Paddington? is that Calvary and Golgotha? This is glossed by 27.25ff where “ever-weeping Paddington” is identified as “that mighty Ruin / Where Satan the first victory won” (my italics), where also “the Druids” made “Offerings of Human Life.” The general reference is to Tyburn, London’s place of public hangings from as early as 1196 until 1783. By the time they were discontinued, Blake was twenty-six and undoubtedly all too aware of the eager crowds that appeared for each of the eight public hanging-days—indeed, tradition made these public holidays for all journeymen.25↤ 25 George Rudé, Hanoverian London, 1714-1808, The History of London (Berkeley and Los Angeles: University of California Press, 1971), p. 94. A “Paddington Fair” was a public execution, so called because Tyburn was less than a mile from the village of Paddington,26↤ 26 1811 Dictionary of the Vulgar Tongue. A Dictionary of Buckish Slang, University Wit, and Pickpocket Eloquence, fore. Robert Cromie, rpt. from 1811 original (Chicago: Follett Publishing, n.d. [?1971]), s.v. in whose parish it was eventually included. There is a visionary continuity joining the Druid monuments, Calvary, and Tyburn: Druid human sacrifices “generally consisted of such criminals as were convicted of theft, or any capital crime” (Borlase, p. 121) and Calvary—as the crucifixion of two thieves with Jesus suggests—was, like Tyburn, a site for the execution of common criminals. 3 Milton, copy C, pl. 3. Courtesy of the Rare Book Division, The New York Public Library, Astor, Lenox and Tilden Foundations. Stonehenge was that it had served as a monumental gallows. In Jerusalem, plate 80, Vala attempts to “weave Jerusalem a body” or “A Dragon form on Zion Hills most ancient promontory”: the “form” is that of the Druidic “Dragon Temples” (J 25.4, 47.6). These motifs are illustrated at the bottom of Milton, plate 4 (illus. 3); there a rock-skull emerges from the ground, overshadowed by three trilithons on a mount, reminiscent of the three crosses on Calvary (note Blake’s reference to Calvary on the same plate, quoted above), while on the right the three seem to have joined into a threefold trilithon which suggests a Druid form of the Tyburn gallows.30↤ 30 Cf. Erdman, The Illuminated Blake, Anchor Books (Garden City, N. Y.: Doubleday, 1974), p. 220. One might note also how directly above this structure a spindle or body hangs on high from the end of the line held by one of Blake’s spinner-Goddesses. The rock-skull identifies this scene as Calvary or Golgotha, “which is, being interpreted, the place of a skull” (Mk. 15:22, inter al.). This theme is further developed in Jerusalem, plate 28, where Albion “sat by Tyburns brook, and underneath his heel shot up! / A deadly Tree, he nam’d it Moral Virtue” (14-15)—the “Tree” here joins the cross, Tyburn Tree (cf. OED, s.v. “tree,” B. 4a,b), and the Tree of Good and Evil, complete with a Serpentine form at its base.31↤ 31 Erdman astutely observes that “To correspond to the serpent in the Garden of Eden the typography of Hyde Park supplies the Serpentine River, which Blake in his deviousness never refers to by its own name . . . ” (Blake: Prophet Against Empire, rev. ed. [Princeton: Princeton Univ. Press, 1969], p. 465); one antiquary notes that the fatal tree was “opposite the head of the Serpentine . . . itself being formed in the bed of the ancient stream, first called Tybourn . . . ” (Timbs, p. 809). Tyburn, then, is Zion Hills promontory, “most ancient” because all things begin in Albion and this is “‘the most ancient promontory’ of sacrifice” (Erdman, Prophet, p. 475), “the summit of the cosmic mountain and at the same time the place where Adam had been created and buried. Thus the blood of the Saviour falls upon Adam’s skull, buried precisely at the foot of the Cross, and redeems him”32↤ 32 Mircea Eliade, Cosmos and History: The Myth of the Eternal Return, trans. Willard R. Trask, Harper Torchbooks, Bollingen Library (New York: Harper & Row, 1959), p. 14; see also, George Every, Christian Mythology (London: Hamlyn Publishing, 1970), “The place of the skull,” pp. 51ff. Erdman writes (following Timbs), “It was recalled that after the Restoration the bodies of Cromwell, Ireton, and Bradshaw had been disinterred, hanged, and beheaded, and then reburied [under Tyburn gallows]—another denial of the Resurrection” (Prophet, p. 474). (illus. 4). The use of the word “promontory,” as Tolley notes, is singular—it serves perhaps to bring in several associations. The promontory is a visionary scene (like the Atlantic mountains of America), a “head-land” offering a vista on the Sea of Time and Space (cf. 3 Henry VI, III. ii. 134-36); it is the sterile earth to which Hamlet equates it (II. ii. 311); and finally, it is the covering of the fallen mind: in Paradise Lost the angelic host defeats the rebels and “on their[e] heads / Main Promontories flung” (6.653-54; cf. J. 71.55 cited below). Ultimately the most ancient promontory is the reader’s skull (Golgotha/Golgonooza), “Once open to the heavens and elevated on the human neck” (Eur 10.28), but now imagining and enclosing all these mountains of and in the mind. 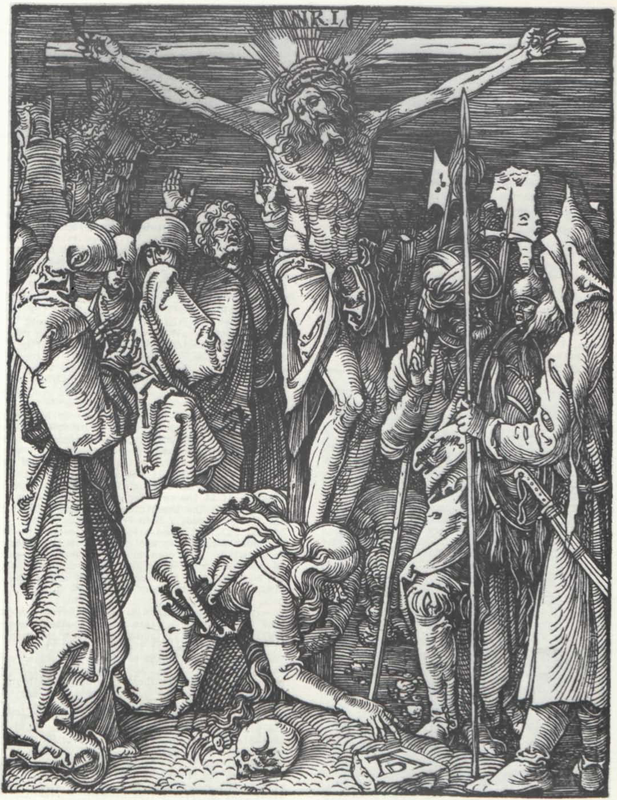 4 Albrecht Dürer, “Crucifixion,” from the Small Passion (1509-11; 127 × 97 mm.). Courtesy of the British Museum. From bright Japan & China to Hesperia France & England. and though at present “Jerusalem lies in ruins: / Above the Mountains of Albion, above the head of Los” (J 71.54-55), in the words of Isaiah, “it shall come to pass in the last days, that the mountain of the LORD’s house shall be established in the top of the mountains, and shall be exalted above the hills; and all nations shall flow unto it” (2:2).